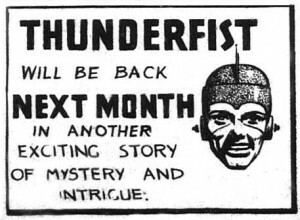 “Thunderfist,” what a great name for a superhero. 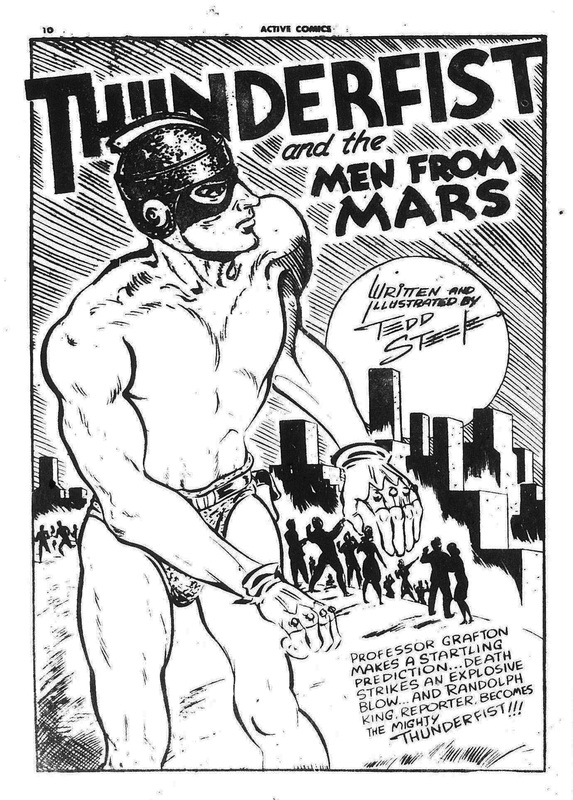 E. T. Leagault came up with this early in 1942 after having being the sole writer and artist for Cy Bell and his one title at that time, Wow Comics which featured two other Legault creations, Dart Daring and Whiz Wallace. 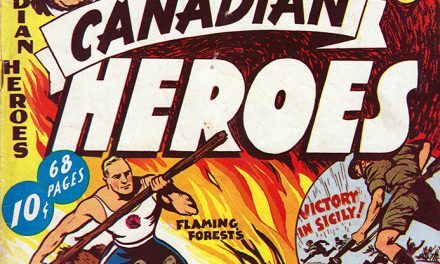 The first issue of Wow Comics was cover dated September, 1941 and came out on the stands after half-dozen issues of Better Comics and a couple of issues of Lucky Comics issued by Maple Leaf Publications out of Vancouver had already been in the hands of lucky kids across the country. 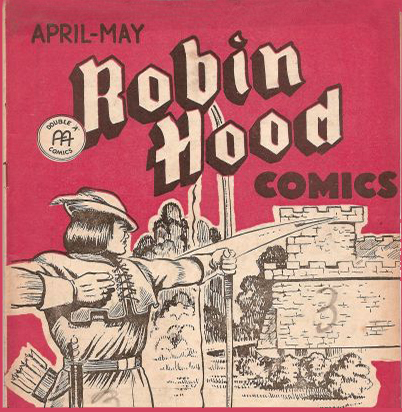 A handful of other titles such as Robin Hood Comics, Freelance Comics, and the first issue of Triumph-Adventure Comics had also been available by the time Wow Comics No. 1 hit the stands. 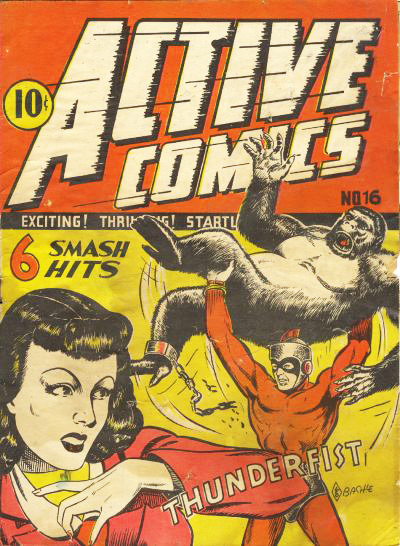 By the end of 1941 Cy Bell had hired Edmond Good to be Art Director for his Commercial Signs of Canada publishing house which quickly, in February of 1942, put out two new titles Dime Comics and Active Comics. 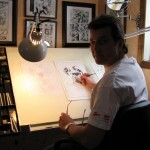 It was in the first issue of Active Comics that Legault’s creation and script was concretized through Murray Karn’s artistic talents. In Active Comics No. 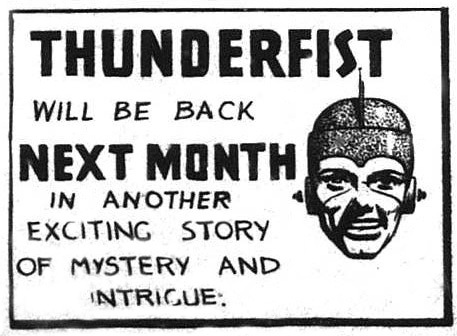 1, we learn that Thunderfist was originally Randy Steele, the overly athletic twin brother of scientific electrical wizard Danny Steele. Danny is tragically killed by fifth columnists and, after vowing vengeance, Randy (who also seems to have a specialized knowledge in the area of electricity) spends part of every day in a lab (perhaps following his brother’s notes) until he develops a super-charged electrical outfit that gives his the strength of a dozen men; the power to throw a devastating and explosive super-punch (hence his name); the power to travel through the air on an electrical charge (especially that in telegraph lines) at lightning speeds; his electrical charge also made his costume invulnerable to bullets. 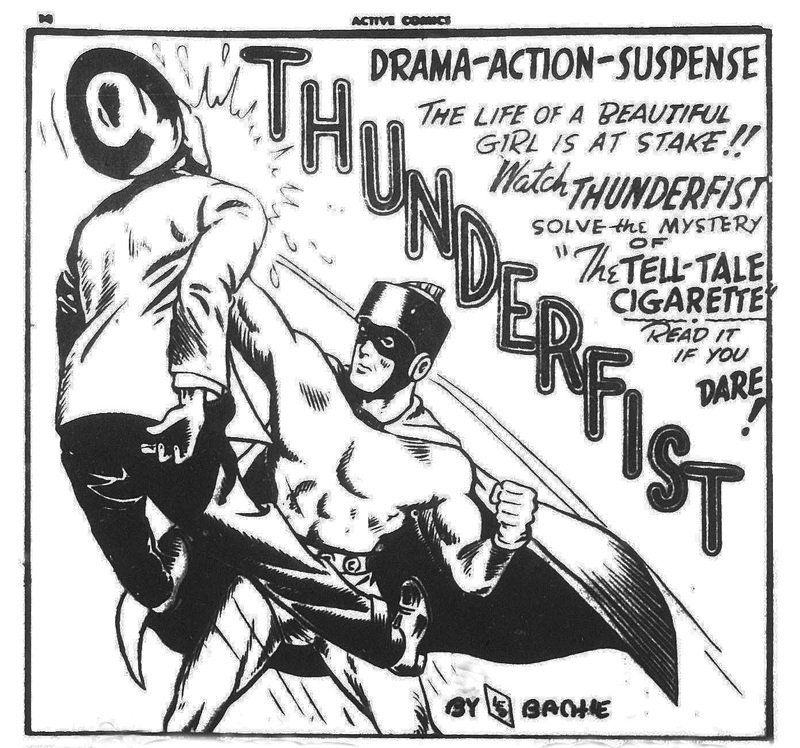 It’s funny that whenever you see Thunderfist in the black-and-white pages of Active Comics, it looks as if he is shirtless and that his costume is made up of a pair of trunks, gloves, boots and a helmet. It’s only when you see him colourized on a cover that you see the costume has a top and leggings. 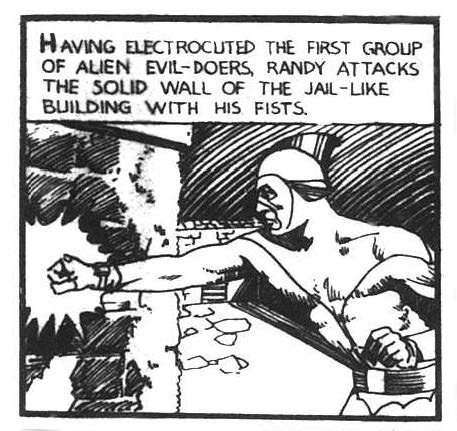 Randy also invented a tiny wrist TV that could somehow pick up images from anywhere on earth. His helmet, with its metal Mohawk, presaged Infantino’s choice for Adam Strange. Thunderfist most often viciously dispatched the criminal element by electrocuting them through his costume’s charge—he was a walking electric chair. Legault seems to set his stories somewhere in New England (he mentions Maine in Active No. 4 and No. 10) and he also introduces Beverly Holmes, reporter for one of the largest local newspapers as a love-interest for Randy. 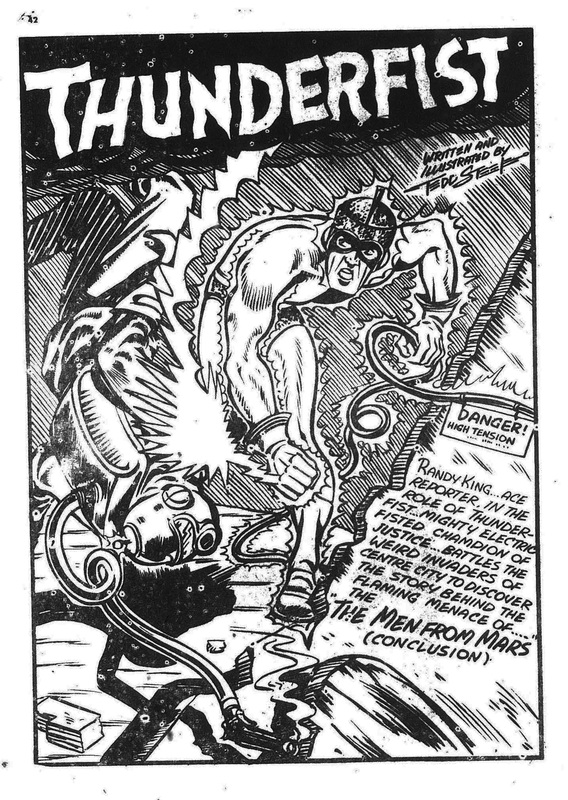 Thunderfist is not a Canadian super-hero (in the fashion of Nelvana, Speed Savage, The Brain, and others who were based and operated in Canada) on the basis of his home and area of operations. Legault kept on with the scripts for the first six issues and with Active Comics No. 7 Karn was also assigned the writing duties (he had already proved that he could do this with his own creation, Jeff Waring, in Wow Comics. 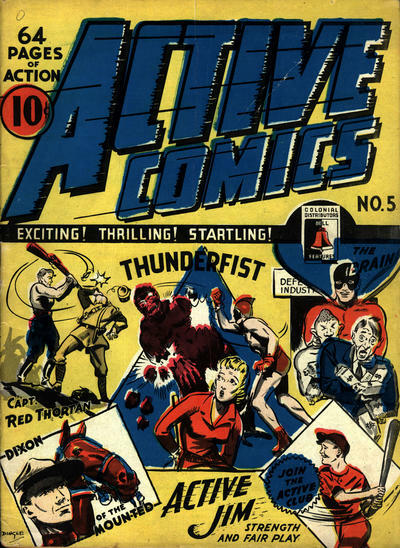 Karn does bring Thunderfist, as Randy Steele, to Canada briefly in Active Comics No. 8 to attend a conference of scientists in Ottawa. His flight is sabotaged and he ends up on the Scarborough Bluffs. Karn makes a small change in the original costume by making the mask just under the brim of the helmet black in Active Comics 10 and it stays this way for the rest of the run. 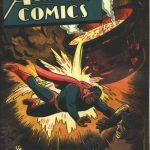 Active Comics 12 (Aug/Sept. 1943) is Karn’s last Thunderfist. 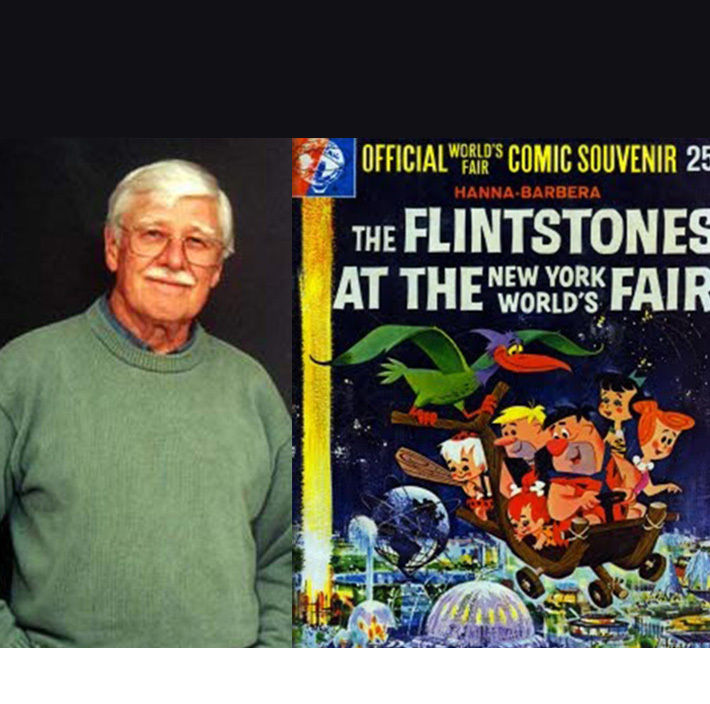 He was drafted around this time and Johnny Canuck creator, Leo Bachle, took over the strip for the next 10 issues. 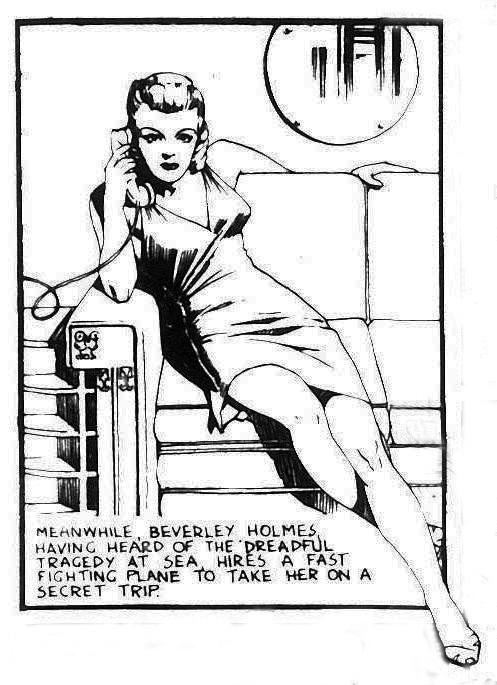 While Karn presented his creation after the fashion of a stiff Alex Raymond, Bachle’s lines were smoother and more fluid. 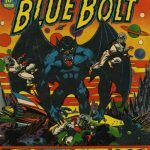 Beverly Holmes does not seem to have as much presence in Bachle’s version of Thunderfist and is almost totally absent in Active Comics issues 14-18. With Bachle, the brim or brow of Thunderfist’s helmet becomes more pronounced and the Mohawk fin less so. He also changes Thunderfist’s square cut costume shorts to a briefs-type which stay with him until for the remainder of his appearances. 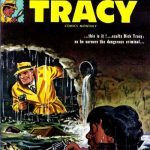 In Active 15 Bachle makes Randy Steele a reporter for the “Times” this becomes the Star by issue 19 and Beverly Holmes returns. For the last couple of issues he had the strip, Bachle, for some reason, gave Thunderfist a cape. 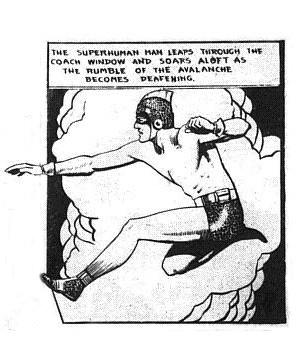 Perhaps he wanted to raise the profile of Thunderfist up to the level of some of Bell’s other caped crusaders such as Nelvana, The Brain, The Wing, and Captain Wonder. He needn’t have. Tedd (by now using two “d”s in his name) Steele takes over Thunderfist in Active Comics 23 (June/July 1945) and changes the name of Thunderfist’s alter ego to Randy King, perhaps to avoid confusion or clashing with his own surname. He also renders him capeless again—a positive move. 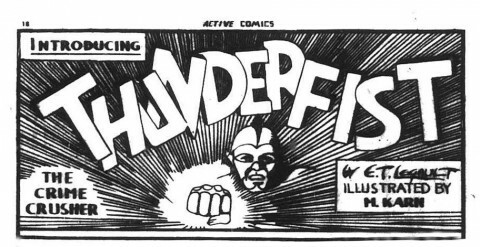 He produces a story arc which proves to offer the last four appearance of Thunderfist in Active Comics (Nos. 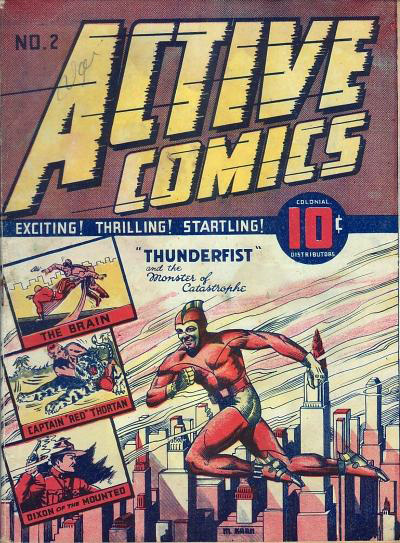 23-26) and called “Thunderfist and the Men from Mars.” Perhaps this arc doesn’t rank among the great Bell story arcs such as Dingle’s Nelvana, Legault’s Dart Daring and his Whiz Wallace, or even Edmond Good’s Rex Baxter saga in Dime Comics, but it’s a solid way to send off Thunderfist and, for me, the best part of the whole run. Tedd Steele’s Thunderfist figure is spidery, liquid and rubbery… something like “Stretch Armstrong” in a mask and helmet. His stories are always text heavy and he squeezes into his panels and in this arc his usual quirkiness is absent here. The Mars Men turn out to be criminals trying to cause a stock market slump so that they could take advantage of it. Steele’s depiction and this arc is my favourite of all the Thunderfist appearances because it’s so dense and animated and because Steele is one of the WECA creators I like best. Dingle’s on No. 5, and Bachle’s on No. 16. 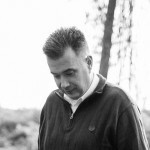 He has, though, stood the test of time and that for me is the definition of what makes something classic. 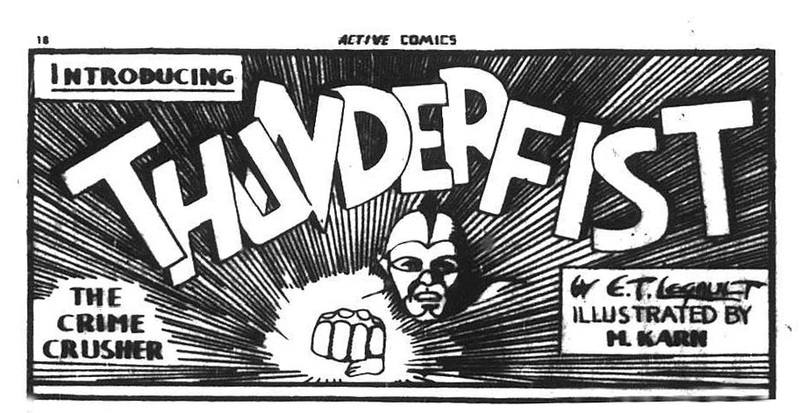 Thunderfist was one of the Canadian war-time comics’ classic superheroes. PreviousAlright Kids, Break Out Your Rhyming Dictionaries! 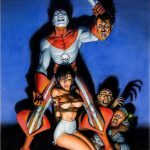 A very nice hero-history of the Thunderfist character. One of the few Canadian comic characters who had gotten a reprint of his tales, courtesy of Memory Lane Pub.s (Captain George Presents #42 from 1969). 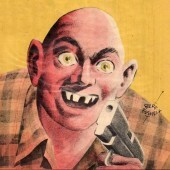 I wonder what happened to old Edmund Legault? Thanks again, Jim. I have to get a hold of that CGP 24. 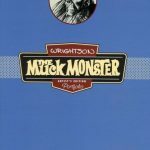 I have the old Whizzbangs that reproduce a Whites page here and there but not that issue which is full of repros. 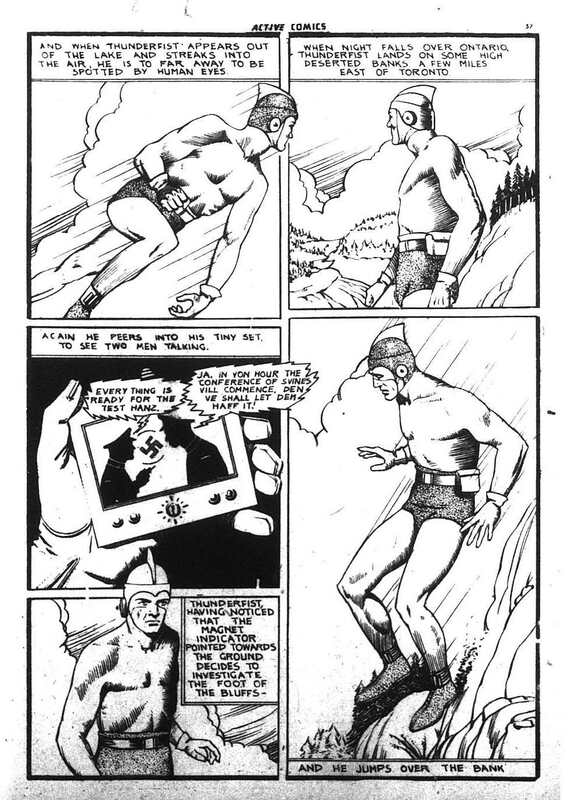 Legault is one that handful of Whites artists that I cannot trace anything on.His last comic work seems to be around Wow Comics 19 at the start of 1944. Maybe he got drafted or went on to other graphic work. He may have moved up north to the Parry Sound area but other than that, I can’t say but would love to find out. One of my favorite charecters. I quite like Steele’s final Thunderfist story. You can see him really embracing his cartoony style after a year or two of trying to figure himself out. It’s bold, crazy dynamic, and unlike anything else I’ve seen. It’s hot mess sometimes that totally works. You also see Leo Bachle developing his own, much richer style in the Quality Comics vein – Lot’s of caricatured thugs and loose limbed poses. It would serve him well in the States and in his later performing career. I find Steele’s writing and illustration appealing because it has that positive sense of distortion that Kirby has. Steele’s later work reminds me of the art being seen through a carnival hall of mirrors. It’s too bad that almost immediately after the Whites disappeared, Steele seems to have given up illustration altogether and turned to a career in writing.